Okay, so I really enjoy reading author blogs. Published. Unpublished. I like getting a slice of their life and a feel for their voice and personality. I first got introduced to blogs through knitters. Yes, I’m a closet knitter. Very relaxing. Good brainstorming time. 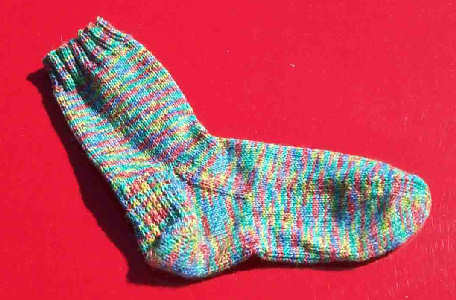 Okay, here’s a sock I knitted. Cute, huh?? You know what I’ve found now? I’m ANNOYED if I go to an author’s site and she doesn’t have a blog. I mean, I WANT to read it. “hear” it. I know blogging isn’t for everyone. They don’t have enough time. It’s not worth it to them. If they’re going to write, it’s going to be on their book. But the fact is, I’m disappointed if I don’t see a blog. Really disappointed. It’s not like I’ll have a reason to keep going back to their website very often. How many times can you look up backlist or an upcoming release? Why do so many authors pass up this chance to have readers come back to their site again and again? 1. Author blogs that don’t allow comments. What’s the point? Oooh, I tried to teach myself how to knit and 😳 I’m embarassed to say, I can’t cast to save my life. DIY has a video on their website so next time I have a moment, I’m going to try it. As for blogging and authors, I’m still in the “I can’t believe they don’t have a website” phase and the “Gee, it would be nice to have recieved a reply to my gushing email. You ain’t Nora Roberts, so the least you can do is reply” phase. I’m fairly new to blogging. I had a raving rant about motherhood and the myth of the perfect mother and I didn’t have a place to put it, so I created a blog. Now, I read alot of blogs to see how everyone else feels about things and to say, hey, I hear you, particularly writers blogs. I would think it is a great tool to keep readers coming back to your site. Readers are fascinated with writers. I can imagine not being too personal because there are some wacky folks out there, but to express your own frustrations at your craft or to share your triumphs with others would seem like a good idea. Agree with you, Kacey. I like also when the author has contests and articles on their site, so it’s not only all about their books. Great sock. I used to crochet until I was talking on the phone and crocheting and pulled a muscle. Ouch. Michelle, good point about people who don’t allow comments. Or the people on freebie blog sites that only allow comments from members of their “system”. And both Michelle and Larissa bring up good points. If you’re not visiting other blogs and being part of the blogging communtiy, why should people visit YOUR blog?? I agree with you, Kacey, and Michelle too. I have the same pet peeves. And I don’t even need to see DAILY entries from them, maybe just 2-3 a week would make me happy. Pretty sock! Yes, I see authors with no comments and wondering why their blog isn’t working and I’m thinking, duh! You don’t go to anyone else’s! I agree with Kacey. It bugs me when an author doesn’t have a blog. Another pet peeve is the same as Michelle’s. I don’t like it when you can’t post comments. Love the sock. I couldn’t knit to save my life.